Fan-filmed video footage of SYSTEM OF A DOWN's entire June 1 performance at Hallenstadion in Zurich, Switzerland can be seen below. SYSTEM OF A DOWN drummer John Dolmayan said in a recent interview that it's "very disheartening" that the band hasn't released a new album in nearly twelve years. Speaking to Las Vegas radio station X107.5, Dolmayan said: "In our band, the difficulty really isn't, 'Is one of us gonna fall off the wagon or get into a bad situation?' It's really a matter of, 'Are we gonna come together and make something happen?' It's been about twelve years since we've put out an album." Dolmayan revealed in a 2016 interview with Kerrang! 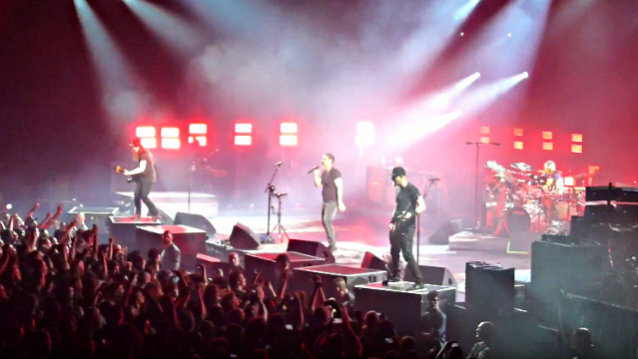 magazine that SYSTEM OF A DOWN had written more than a dozen new songs for a possible follow-up to "Mezmerize" and "Hypnotize", which came out in 2005. Singer Serj Tankian — long speculated to be the holdout on recording — not long ago said that a new album was not on the radar. "As far as a SYSTEM record, there's nothing in the plans right now," he said. "It's something that we'll do down the line when it's the right time. I've got a lot of stuff going on right now on my own, and trying to get all those releases out and work on them. But we've really been enjoying playing together on tour and having a blast, and I think our performance is actually better than it's ever been in our heyday." Dolmayan maintained that music for a new SYSTEM album does exist, and that he feels it can "match or beat anything we've done in the past... It's a matter of getting together and putting aside whatever differences, or whatever problems people have — which don't seen to surface when we're together, by the way." The band will spend June and July in Europe playing summer festivals and select headline dates.